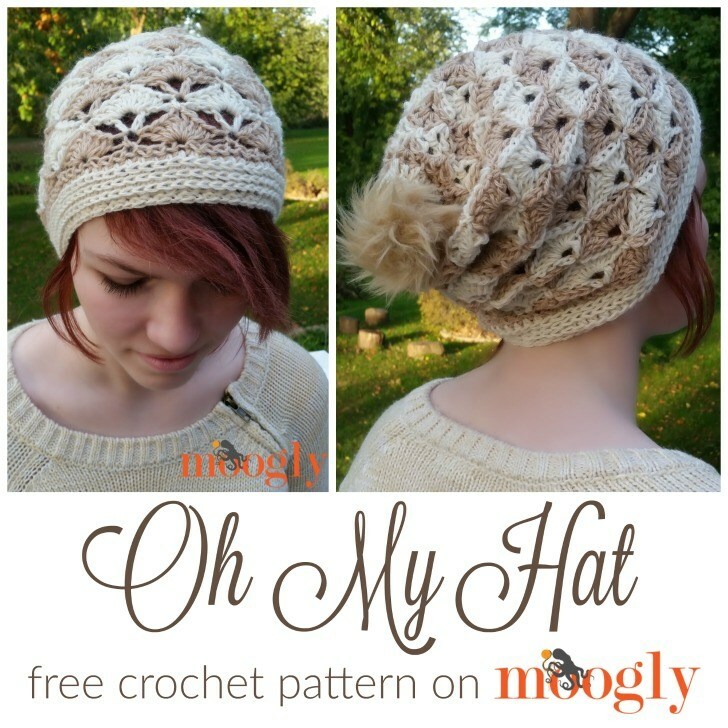 The Oh My Cowl was too lovely to stay single for long – now there’s the Oh My Hat to match! 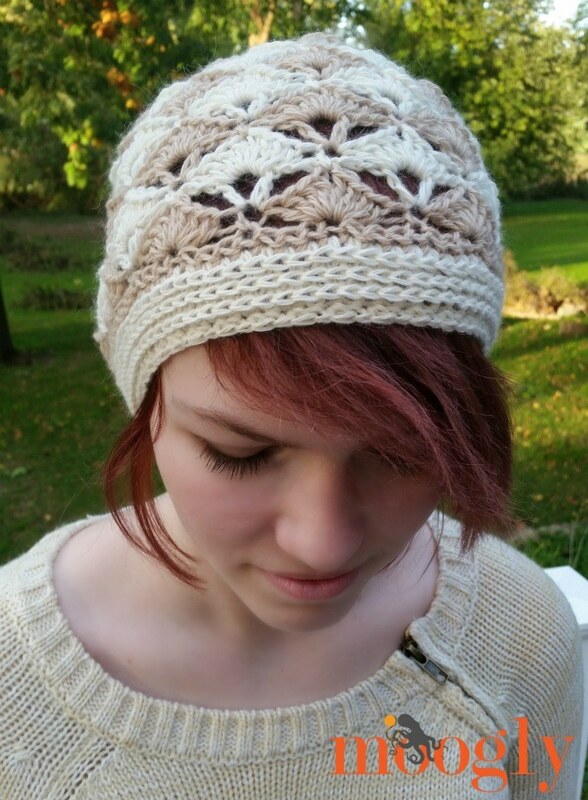 The Oh My Hat can be made beanie style or slouch style – the slouch style is shown here. 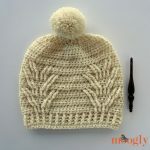 It fits most teens/adults and is topped off with an (optional) pom pom. You can make your own, or use a purchased one like the fun Lion Brand fur one shown here! 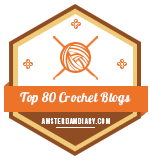 Crochet abbreviations and tutorials; more tutorials linked within the pattern. Note: This hat is worked from the bottom up, then the brim is added afterwards. FOR THE SLOUCH STYLE: Round 7 – 18: Repeat Rounds 3 – 6 three times. Go to Round 19 below. 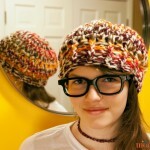 FOR THE BEANIE STYLE: Round 7 – 10: Repeat Rounds 3 – 6 once. Go to Round 19 below. Round 3: With next largest hook (US-H, 5.0mm), repeat Round 2. Round 5: Continuing with smallest hook, ch 1, *(sc, dc) in next st, skip next st; repeat from * around, join and break yarn. 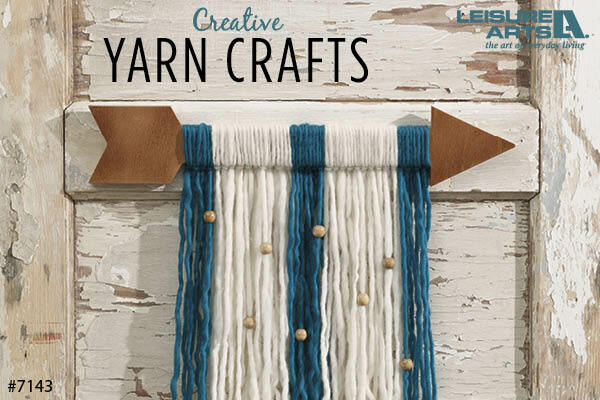 Gather the crown using long tail and weave in ends. Add PomPom (optional). 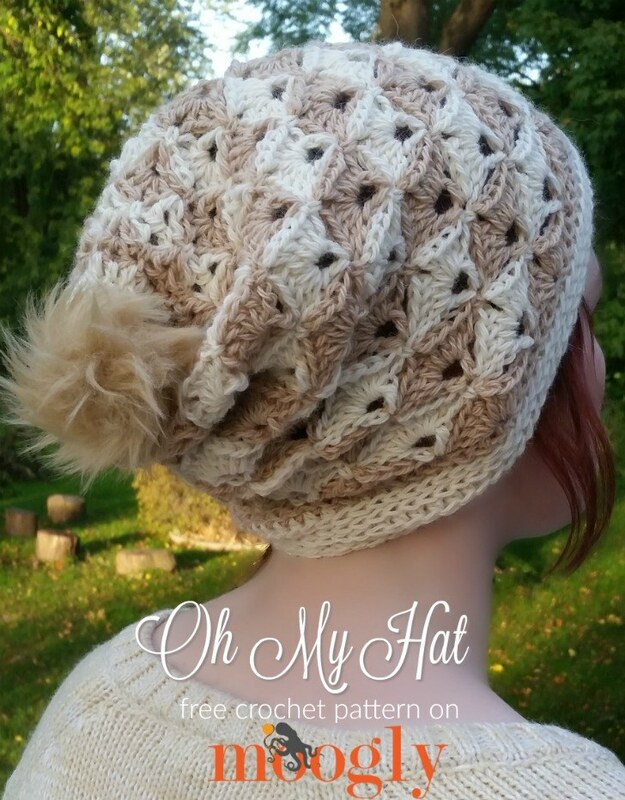 And that’s the Oh My Hat! 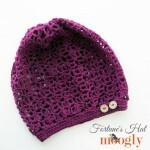 I hope you enjoy this free crochet hat pattern – and the matching Oh My Cowl! What other pieces do you think should be added to the Oh My Collection? Let me know in the comments! Did you try the green Print Friendly button? Oh good! It’s an external plugin so it must have been quite busy! How did you attach your pompom? I have bought some lionbrand pompoms and they have a elastic band on the back. Is it easier to use those or sew it on? 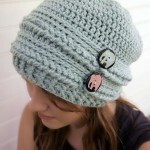 about the brim, it says hdc in each stitch around for a total of 80stitches, how is that possible? the foundation chain is 104 stitches, did I miss something? Thank you! And thank you for letting me know – typo on my part! 🙁 It should be chain 81, for 80 sts. I’m very sorry for my error, it’s been fixed in the pattern. Oh! I thought I was gonna go insane trying to figure out what I missed haha it’s alright, typos happen 🙂 you should also change the number of big shells, with 80 sts, it is 10 big shells. Lol, no worries – I should probably read patterns more closely before I start! Thank you! 😀 It’s on my to do list! I’m a bit confused about the “gather the crown” at the end of the brim. Can you clarify? Thank you! 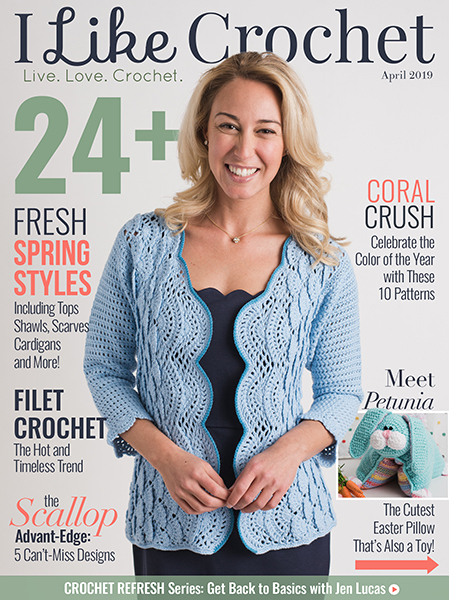 I’m looking forward to trying out the pattern. Just waiting for the yarn :). Thank you Lilu! There’s a video tutorial that explains it – just click where the words “gather the crown” are pink – that’s a link! 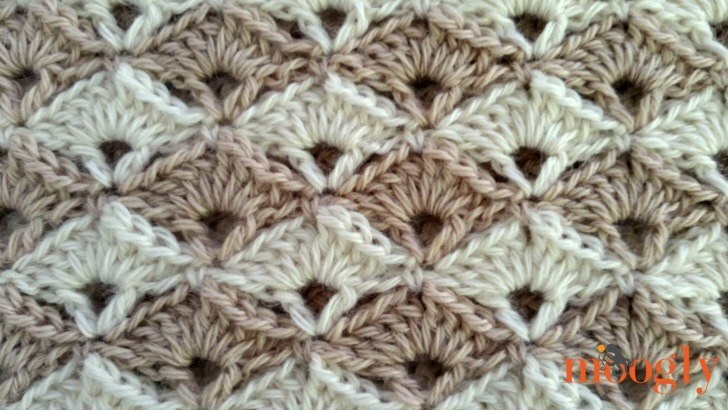 I know that when I first viewed this pattern there was a video showing how to do the stitch and the carrying of yarn. Now I can’t find it. Is it suppose to say 2 dc in the ch-1 of the next V st (not in 24 but 25)after the sc in ch-1 sp of next Row 24..I’m gonna go with the next V for now and see how it turns out?? It worked out – I need to take a pic to send – my Q was on round 26 – it tells you to 2 dc in the ch-1 sp of the next row 24 (I think should be 25 – this was my question – this is what I did and it worked) because if we are to sc in that sp, then 2 dc – in doesn’t work or make sense to me – but then I’m a little off too. Well as long as it worked out, that’s the important thing. 🙂 Hooray! I see that someone has already suggested fingerless gloves. Not relevant to me, but a child-size hat and mittens might be an idea. I intend to make the pattern into a simple, straightforward scarf (to fringe or not to fringe?) and/or a shawl and/or a throw and/or an afghan. 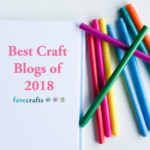 This pattern would also make a gorgeous christening shawl – the sort that becomes a family heirloom – not sure what yarn/hook size you would use – lace? baby yarn? 1.5 – 2.5 hook?. I’m going to have to give up this internet business – I’m not going to live long enough to make all these glorious patterns! 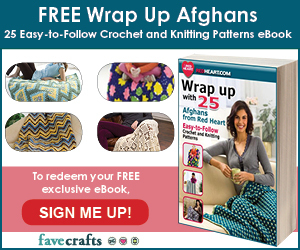 Have you made this with a heavier yarn? I want to try it with lion brand homespun but I’m not sure what I should use as the foundation chain amount. I thought about decreasing it by 16 and go from there…. :/ I’m afraid it might turn out to tight. I just finished the pattern.I love how it came out and I didn’t even need a video tutorial!!! The pattern was well written and really easy to follow.I can’t wait to get started on the other patterns using this stitch. 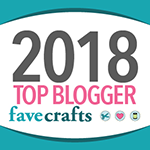 Thanks so much for all the free patterns!!! Thank you so much Julie! I’m so glad to hear it! Hello I’m on row 27 where you dc2tog and I’ve had to frog the row at least five times now because I can’t seem to get the 15 stitch count where is it being dc2tog at? 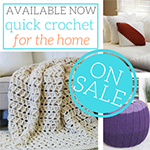 between the double crochets in the last round or the single crochets in the last round? because I either get 11, 12 or past fifteen when I get done counting the row. I’m only on row 5 but I LOVE this pattern. I am using a Caron Cup Cake because it was gifted to me, instead of alternating colors on my own. Can’t wait to see if it turns out well with the colors, but it’s SO fun to make. Thank you. 😀 Thank you so much Liz! I bet those colors are working up beautifully! Just finished the cowl and hat. A gift set for my sister. I hope she likes it as much as I do. It is probably one of my favorite things I have ever made. Made it in black and heather grey and it is gorgeous together. Thank you so much!!! Happy New Year!!! 😀 Thank you so much Nancy!